A self-service udon noodle restaurant in Kansai International Airport, Za U-don got halal accreditation from the Malaysian Halal Consultation & Training, according to Kansai In-flight Catering Co., the operator of the service. Kansai In-flight Catering Co. is part of the restaurant chain operator Royal Holdings Co. The latter got requests for halal food from people traveling to Islamic countries. So far, the Osaka airport had no halal restaurants, Kyodo reports. Halal means permitted or lawful according to Islamic Law which forbids the consumption of pork and alcoholic drinks among other requirements. 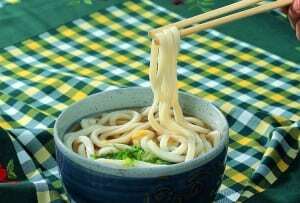 Udon is a type of thick wheat flour noodle of Japanese cuisine. Udon is often served hot as a noodle soup in its simplest form, as kake udon, in a mildly flavoured broth called kakejiru, which is made of dashi, soy sauce and mirin. It is usually topped with thinly chopped scallions. Other common toppings include tempura, often prawn or kakiage (a type of mixed tempura fritter), or aburaage, a type of deep-fried tofu pockets seasoned with sugar, mirin, and soy sauce. A thin slice of kamaboko, a halfmoon-shaped fish cake, is often added. Shichimi can be added to taste.